John Robert Lord was born in Subiaco, Perth, Western Australia on 10 November 1949 and educated in Perth and Kalgoorlie. He joined the RAN College as a Cadet Midshipman in 1965 and, following graduation, was awarded the Queen's Medal (1968) for 'exhibiting the most exemplary conduct, performance of duty and good influence among his peers at the college'. He proceeded to sea for further training in HMA Ships Queenborough, Sydney and Derwent and was promoted Sub Lieutenant in December 1969. Lord then traveled to the United Kingdom, in early 1970, to undertake courses at Britannia Royal Naval College. On his return to Australia he was appointed to the guided missile destroyer HMAS Brisbane in October 1970, and saw active service in her during the ship's deployment on the 'gun-line' in Vietnamese waters during March-October 1971. He was promoted Lieutenant in November 1971 and became the Executive Officer of the patrol boat HMAS Aitape during which time she operated in Papua New Guinea waters. Lieutenant Lord served as flag lieutenant to the Chief of Naval Staff in 1973-74. He then went on to undertake courses in the United Kingdom; qualifying as a warfare and navigation specialist. He subsequently served as the navigating and operations officer in HMA Ships Vendetta, Hobart and Supply. While serving in Vendetta as navigator, the destroyer deployed to Darwin in early 1975 to assist with the cleanup and rehabilitation of the city in the wake of Cyclone Tracy. He also completed shore postings on the staff of the Commander Mine Warfare and Patrol Boat Forces and Fleet Commander. 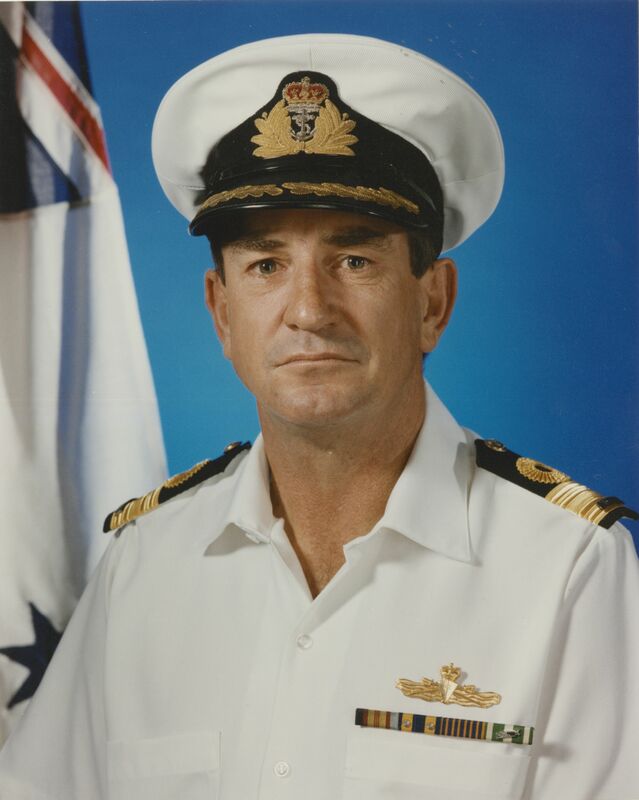 Promoted Lieutenant Commander in November 1979, John Lord completed the advanced navigation course in 1980 and, after promotion to Commander, the Joint Services Staff Course, Canberra in 1983. Following this Commander Lord served in the Directorate of Naval Officers Postings in Navy Office, Canberra. He was appointed commanding officer of the guided missile frigate HMAS Adelaide in April 1987. The ship took part in Operation MORRIS DANCE following the military coup in Fiji that year and was on standby to evacuate Australian nationals if required. He relinquished command of Adelaide in April 1988 and, on promotion to Captain in June of that year he returned to Navy Office firstly as the Director Naval Officers Postings and then as Director Combat Force Development. He completed his second 'drive' as the Commanding Officer of the guided missile destroyer HMAS Hobart during May 1991-November 1992. The highlight of this command was the ship's deployment to Execise RIMPAC 92 at San Diego. In 1993 John Lord attended the Royal College of Defence Studies, London to prepare him for more demanding senior officer appointments. He was promoted Commodore and on returning to Australia, in early 1994, he was appointed Commodore Flotillas in Maritime Command and then in December of that year became Commander Northern Command, based in Darwin. During 1995 he commanded the Blue force during Exercise KANGAROO 95. John Lord was promoted Rear Admiral on 11 February 1997 and appointed Naval Training Commander and then the Head Joint Education and Training for the period 1998-99. He was appointed as a Member of the Order of Australia (AM) in the Australia Day Honours List 1999 for 'exceptional service to the Royal Australian Navy and the Australian Defence Force as the Commodore Flotillas at Maritime Command Headquarters, and as Commander Northern Command'. Rear Admiral Lord's last appointment was as the Maritime Commander - Australia during 1999-2000. This was a particularly busy period with several RAN warships deployed to East Timor in support of Operations WARDEN, STABILISE and TANAGER. He retired from the RAN in 2001 and has since worked as an advisor to senior government agencies and acted as a mentor for business executives. John Lord has also has held several directorships including with P&O Maritime Services, Australian Maritime Systems, the Singapore-based Austen Maritime Services and the Marine Board of Victoria. He is currently the Chairman and Independent Director of Huawei Australia (part of a large Chinese telecommunications and networking company).